Today is the International Volunteer Day for Economic and Social Development, officially recognized by the United Nations since 1985 to promote the importance of volunteering and its role in socio-economic development. This year’s theme is “The world is changing. Are you? Volunteer!” International Volunteer Day 2015 challenges everyone to take a personal role in implementing the newly launched Global Goals, the 2030 Agenda for Sustainable Development, by actively engaging in our world. Volunteering mobilizes communities and government to create safer streets, better public spaces, and a happier, healthier planet. In his statement for International Volunteer Day, United Nations Secretary General Ban Ki-Moon stressed the potential of volunteering in bringing people together across cultures and countries: “Volunteerism is a global phenomenon that transcends boundaries, religions and cultural divides. Volunteers embody the fundamental values of commitment, inclusiveness, civic engagement and a sense of solidarity.” Secretary General Ki-Moon especially emphasized the potential of volunteerism to show solidarity and end poverty. This December 5th, Dar Si Hmad marks International Volunteer Day by encouraging volunteerism in Morocco and taking a minute to thank the incredible team of volunteers that make our work possible. Dar Si Hmad’s recent workshop on international educational exchange programs highlighted the importance of volunteering. Through volunteering, youth learn more about themselves and the world and set themselves apart from their peers. Civic engagement is a required component of many exchange programs, including the MEPI Student Leaders opportunity. Dar Si Hmad’s RISE program is including a unit of civic engagement in its professional development training for urban youth in southwest Morocco. RISE participants will join Dar Si Hmad staff in several hours of community service, getting their hands dirty to give back to their communities while simultaneously building their skills and capacities. Dar Si Hmad’s internship program provides young people with an organized volunteering opportunity. Last year, Mohamed Amine Bouhamtaine served as a Communications Intern in our Agadir office. 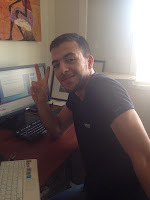 Born in Agadir, Amine studied computer science and networks at the Higher School of Technology of Agadir and graduated in 2014 at the top of his class. Amine is interested in the new technology, including the creation and development of software and web applications, programming languages, 2D/3D video games, information security, and server technologies. His work with Dar Si Hmad gave him the chance to use his passions to make Agadir a better place as well as learning more about the rural communities surrounding his birth city. Agadir youth engage in their communities in a variety of ways. At a recent workshop, RISE participants interviewed each other about what activities they were most proud of. During the feedback session, one young woman highlighted a project undertaken by her new friend. He has coordinated a series of volunteers to travel to the Bled (countryside) to provide resources and support in some of Morocco’s poorest areas. After describing the project, she ended by saying “I am so proud of my friend” and stressing how happy she was that his work is pushing against the economic and opportunity disparities between rural communities and urban centers in southwest Morocco. These kinds of projects demonstrate the potential of volunteering to make strides toward ending poverty. The United Nations Volunteer Programme is also stressing the role of volunteering and community engagement in ending violence against women. In Uganda, UN Volunteers are supporting the Ministry of Health through a “Let Girls Be Girls” campaign raising awareness about the need for improved education and access to healthcare. The movement is decreasing the rate of teen pregnancy in the country. Volunteer efforts are advocating for girls to stay in school longer and highlighting the community benefits from females’ education. These efforts mirror much of Dar Si Hmad’s work through our Girls’ E-Learning and Water School programs and are powerful examples of how volunteers, communities, governments, and international agencies can partner to end violence against women, reduce poverty, and promote sustainable development. Volunteering makes a difference. Volunteerism positively impacts the volunteer, their community, and our planet. On this International Volunteer Day, Dar Si Hmad salutes volunteers around the globe and encourages you to join them and us in building a better world.